Welcome to Valencia College! 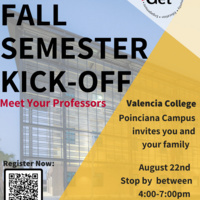 Join us on the Poinciana Campus for the opportunity to meet your professors and familiarize yourself with the campus and their resources. Please use the link below to sign up for the Kick Off and select which campus you plan on attending.